It was so frustrating. As soon as I reached an international destination, I’d get a text from O2 telling me that I was on O2 Travel so paid just £1.99 a day for using the internet while abroad. Yet when I tried to surf the net I got this error message: “Could not activate mobile data network: you are not subscribed to a mobile data service”. I complained several times to O2 (after trips to Dublin and Luxembourg) but each time they told me I was signed up for O2 Travel, so it wasn’t their fault. When this happened yet again when I arrived in Madrid on Thursday I resigned myself to another fruitless call to customer service. 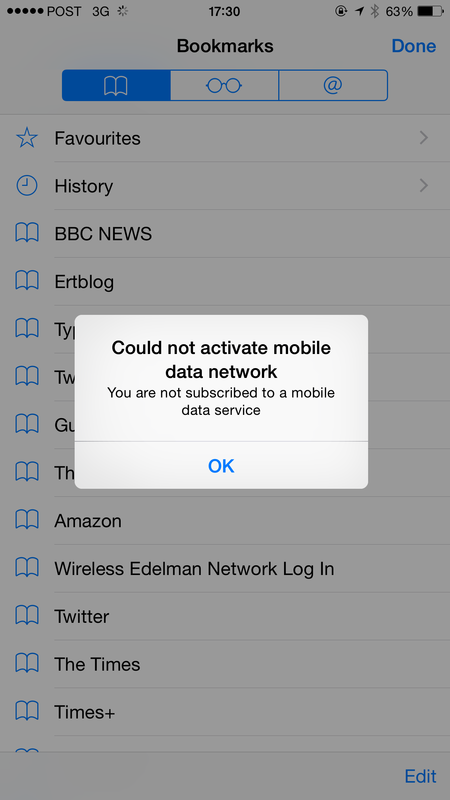 I checked the iPhone settings – and yes, all was set up for overseas mobile data roaming. What was going on? Then I had a brainwave: try changing some of the less obvious setting and see if that made any difference. I spotted a setting (Settings/Mobile) called EU Internet (above). It was on. I turned it off, then tried to load a webpage. It worked! Problem solved. So if you’re blocked from getting online overseas on your mobile, check whether this option is turned on. I’m assuming that this doesn’t affect the £1.99 O2 Travel deal. After all, I’m using an EU smartphone in the EU on an O2 EU contract. The only remaining mystery? 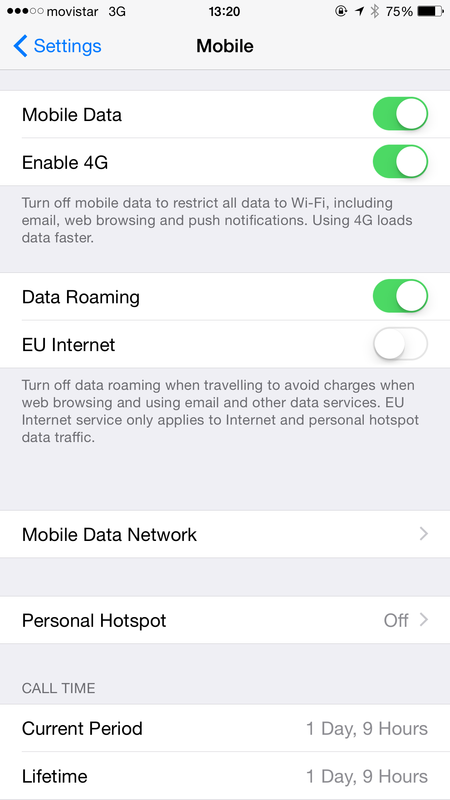 What on earth is the point of this iOS EU Internet option in settings? And is this new to iOS 8? This entry was posted in Tech by Rob Skinner. Bookmark the permalink. You my friend are a rock star!!! I have been dealing with this issue for over a year now and EE customer service always says, well it should work. It solved my query too, thanks a bundle. O2 had neither interest nor suggestion as to why I should have been left in France with no data service – even though their welcome message suggested that I was good to go.